Like many girls in her country, Fatima was forced out of school and into a marriage she didn’t want. Through our Gulmakai Network, Malala Fund works to eliminate cultural beliefs and traditions that prevent girls like Fatima from reaching their full potential. There are 3.5 million out-of-school children in Afghanistan — 85% are girls. We fund Zarqa Yaftali’s field research to identify why girls are out of school and how the government can improve their access to education. 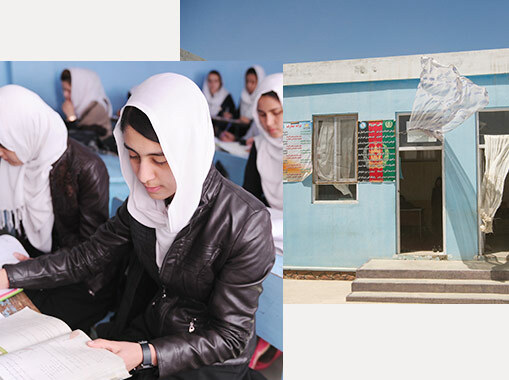 In half of the provinces in Afghanistan, fewer than one out of five teachers is female. Families often will not allow girls to attend classes taught by men. A Malala Fund grant supports Ramatullah Arman’s work to make schools safer for girls by recruiting and training female teachers. One-third of girls under age 18 get married, forcing them to drop out of school. With our support, Zarmina S. works with religious institutions to change cultural beliefs that hold girls back. Meet our Gulmakai Champions in Afghanistan. Inspiring a new generation of leaders with Teach for Afghanistan. Malala Fund Gulmakai Champion writes why Afghanistan’s young population is the country’s greatest asset.